For a tea time segment on an episode of Last Meal (click here for extended trailer), an upcoming web series created and hosted by Barlow owners Aaron & Jessica Grimmer in collaboration with Two Penguins Productions, we wanted to create a cocktail that served several people, and for added flourish we added dry ice to the basket tea pot to create a spooky service element in fitting the theme of the show. A classic punch template was the go-to inspiration for the larger format cocktail to be served from the cold-smoking tea pot — ultimately the Philadelphia Fish House Punch was chosen, if only for the ominous sounding origin of Schuylkill County, Pennsylvania. 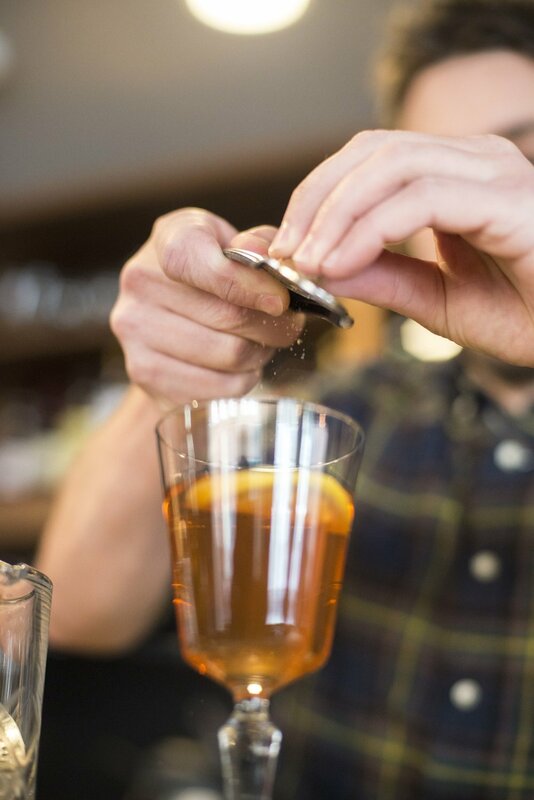 For serving individual versions of the cocktail at Barlow, we take the drink from the teapot, yet are able to retain all the other delicious special effects. The flavor combinations of the Philadelphia Fish House Punch (rum, brandy, lemon, peach) are wildly complementary to one another, and as such, offer some room for exploration and re-balance. For example, the original punch employed a drier style peach brandy which is difficult to obtain—most peach brandy these days is on the sweeter side. To counter that, we swap in a flavorful rye whiskey for the rum. True punches are also sweetened with a citrus oil-infused simple syrup and then balanced with fresh lemon juice to add a persistent backbone; we choose the tart verjus as a more mellow agent in equalizing the liqueurs in the recipe. The side benefit to verjus is that the cocktail can be stirred for a silkier quality, in the process showcasing some of the subtler elements of the other ingredients that might be covered up if otherwise using lemon juice and additional sugar. The final details to the Tempest Tea serve to accent key flavors. Dashes of Peychaud’s bitters bind the cocktail ingredients and add a little rosy color to reinforce the peach theme. The whisper of smoky Scotch contrasts against the stone fruit roundness for balance while harkening back to the unique presentation from the cold-smoking tea pot. Lastly, the freshly grated nutmeg is a hat tip to the drink’s heritage as a punch, and invites imbibers to the subtle layers of the re-engineered cocktail. Pick your favorite American whiskey, either a woodier bourbon or spicy rye works best. At Barlow, we opt for either George Dickel rye for its herbaceous flavor, or James E Pepper for a more toned rye spice. Cognac is great, but smooth American brandy is equally good to carry all the flavors without complicating the drink. 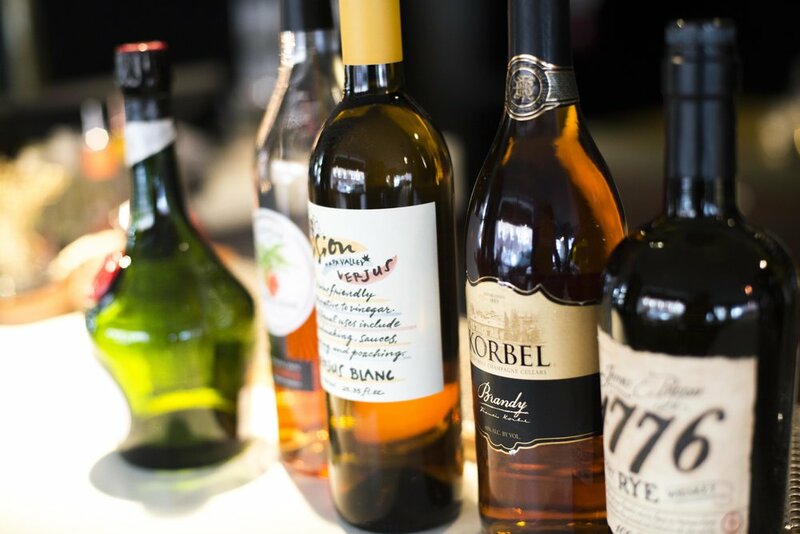 If you splurge on a French brandy, find a reliable VSOP — otherwise Korbel won’t break the bank. Having at least one of the base spirits being a nicer bottle transforms this cocktail from pleasant to memorable. 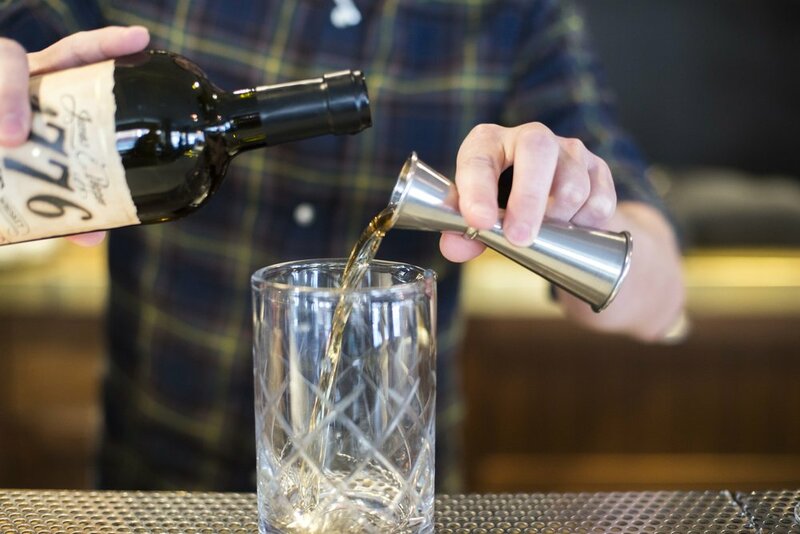 We rely on verjus—fresh-pressed grape juice—to dial in the tartness of this cocktail and complement the other brandy-based ingredients. Specialty grocery stores carry a variety of styles. If unavailable, a smaller amount of fresh lemon juice will work in conjunction with an appropriate amount of simple syrup to create a mild sourness to balance the sweet elements. A quality peach liqueur stands in for hard-to-find peach brandy — we’re fans of the Combier products. Less expensive peach-flavored brandies exist and some, like E & J, are decent. Due to its distinct flavor, only a small amount is required. 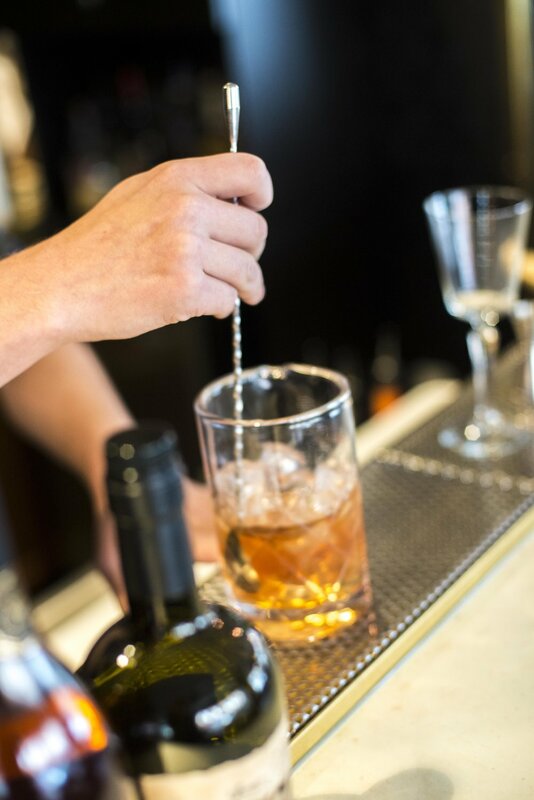 At Barlow, we add depth by cutting the drink with Bénédictine, another brandy-based sweetener, and again in small amount. Demerara sugar is another good substitute if a stronger citrus element is being used, more sweetness is desired, or you want to skip the fancy French liqueur(s). We mist the cocktail glass with a smoky Scotch to parry the sweetness from the peach. 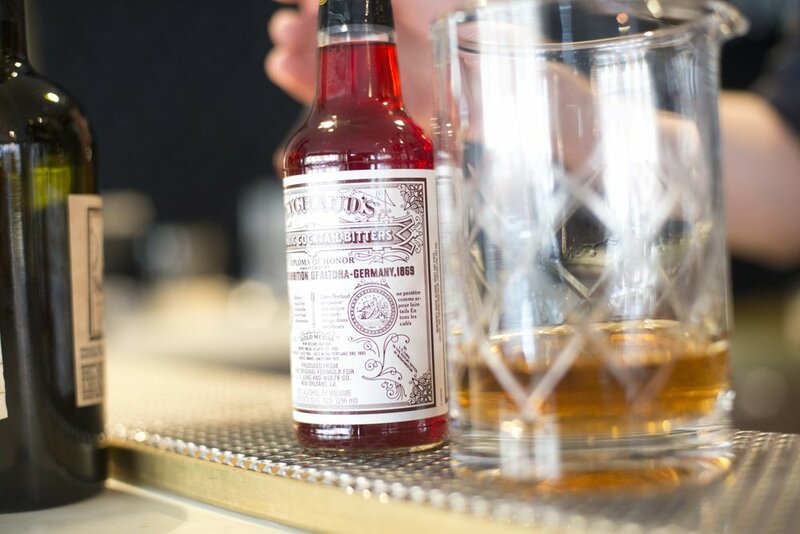 We also dash in Peychaud’s bitters to bind the cocktail and give it a more rosy color and complexity. Both elements are extra for a casual setting, but take this cocktail to the next level. Most home pantries are equipped with nutmeg, so don’t skip the final detail: nutmeg (freshly grated if at all possible) is an inviting aroma to this drink.